Edited to add: here it is in its entirety for free online! Part of the collateral damage of the long ago Protestant revolt and, more recently, all of the upheaval following the liturgical reforms after Vatican II is that many Catholics have largely forgotten about indulgences. Which is a huge bummer for us, because indulgences are a beautiful, charitable, and efficacious practice for kids and grownups alike. 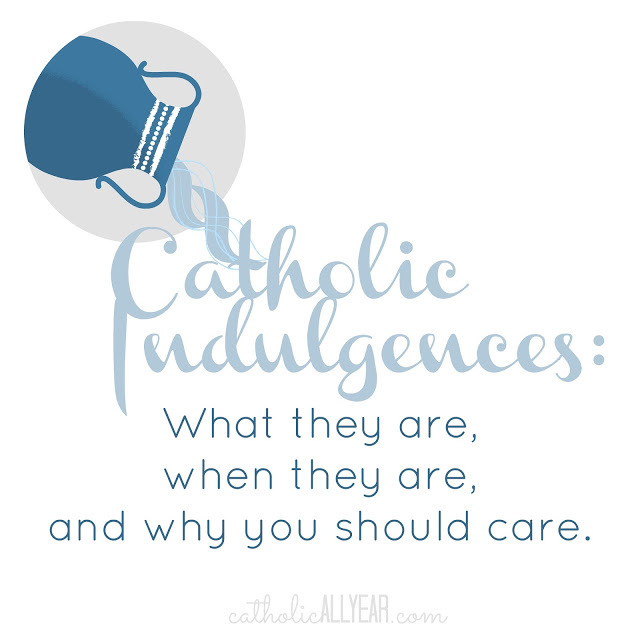 If you don’t know what indulgences are at all, or if you’ve only heard negative things about them, you might want to take a look at the always excellent and thorough explanations given by Catholic Answers. The tl;dr is that indulgences are good and just, and that the bad press they’ve received is due to misunderstandings or to abuses. Oh, and, if you’re Catholic, you believe in them. Indulgences aren’t a money grab by villainous medieval bishops, and they aren’t a get out of hell free card. What they are is the way the Church can exempt a member of the faithful from the temporal punishment due to their sins, after that person has already been forgiven of the eternal consequences of sin through confession, and the sacrifice of Jesus Christ. Say Johnny’s playing baseball in the living room and breaks a vase. He might muster his courage and confess, and he might have true sorrow and contrition, and you might forgive him. You’re not going to kick him out of the house (eternal consequence). But that doesn’t unbreak the vase. The broken vase is the temporal consequence of vase-breaking. It must be replaced. The Bible teaches us that there are always both eternal and temporal consequences of sin. So you might set up a payment plan for Johnny, and allow him to do extra chores and earn money to put away towards buying a replacement vase, as the temporal consequence. But then, maybe all the other kids in the neighborhood pool their savings and go in together to buy a new vase. Indulgences are like that. Our prayers and sacrifices and good works all go in together with the prayers and sacrifices and good works of Christ and the saints who have gone before us and can be applied by the Church where the Church chooses. Binding and loosing and all that. But, just as importantly, indulgences should be seen as the way that the Catholic Church instructs the faithful on which prayers, practices, and devotions will be most beneficial to our souls. The Bible and Canon Law and the Catechism of the Catholic Church are the rule books/guide books. They cover in great detail all the dos and don’ts and the whys and why nots of our faith. The Manual of Indulgences is more like a playbook. It’s specific things to do on specific days or in specific circumstances. While the prayers and practices recommended ALSO have indulgences attached to them that can be applied to ourselves or to the holy souls in purgatory, the fact of their being included in the manual shows that these are the prayers and practices that the Catholic Church believes will be the most beneficial to us. Every one is a twofer. We are gaining a reward: Hey, free vase! But at the same time we are growing in wisdom and prudence and, I don’t know, reflexes, so we’re less likely to break any more vases. And then our future savings can be applied to other kids in the neighborhood who break vases. I feel like this metaphor might be getting away from me. Back to basics . . . The following are the indulgences available to Catholics as of the 1999 Manual of Indulgences. The suggested prayers are required to be an approved version/translation. For an expanded list of indulgences, and more details about conditions and specific actions required, and the full text of prayers, consult the book or ebook or the google books version. Indulgences can be plenary (full) or partial, and so remove either all or part of the temporal punishment due to sins. Indulgences can be gained for yourself, or applied to the holy souls in purgatory, but not to another living person. To gain an indulgence, you must be a baptized Catholic, not excommunicated, and not in a state of mortal sin at the time of the actions taken for the indulgence. You must have the intention of gaining the indulgence, and perform the required actions in the required amount of time and in a devout manner. You can gain many partial indulgences, but only one plenary indulgence per day, except that you can gain a second plenary indulgence at the point of death. If the indulgence requires visiting a church or oratory, you should devoutly recite the Our Father and the Creed during the visit. To gain a plenary indulgence you must be free from all attachment from sin, even venial sin. You must perform the required actions, receive Holy Communion, make a sacramental confession, and pray for the intentions of the Holy Father. It is preferred that you receive communion and pray for the intentions of the Holy Father on the same day that you perform the actions, but within several days before or after is acceptable. These must be performed for each indulgence sought. Confession should be made within three weeks before or after the actions for the indulgence. One confession can apply to many indulgences. The usual prayers offered for the intentions of the Holy Father are one Our Father and one Hail Mary. If all the conditions are not met, the indulgence becomes partial, rather than plenary. Things that we are obliged to do, like Mass attendance, are understood to confer graces and are not enhanced with indulgences. Spend thirty minutes or more in adoration of the Blessed Sacrament. Participate in the Stations of the Cross, using fourteen stations, marked by at least crosses, progressing from one to the next. Recite the five decades of the Rosary in a church, religious community, or family, or while listening live to the Holy Father’s Rosary. Read or listen to Sacred Scripture for at least thirty minutes, preference is given to reading. Make a three day retreat. At the point of death, pray, ideally before a crucifix or cross (requires that you have been in the habit of praying during your life). Participate in a parish mission and its conclusion. Attend a ceremony in honor of a new saint during the first year after canonization (available once). For priests, and those in attendance, a priest’s first Mass, and the jubilee celebrations for priests and bishops renewing their vocational promises. Visit the church during a diocesan synod. Assist during a pastoral visit. Make a pilgrimage to one of the four Patriarchal Basilicas in Rome. Visit a basilica, cathedral, parish church, or approved shrine on its titular feast day. Receive the Papal Urbi et Orbi blessing (usually given on Christmas and Easter) in person, on the radio, on TV, or online. Recite the Te Deum on December 31st in thanksgiving for the year. Recite the Veni Creator on January 1st as a prayer for the beginning of the year, and/or on Pentecost. 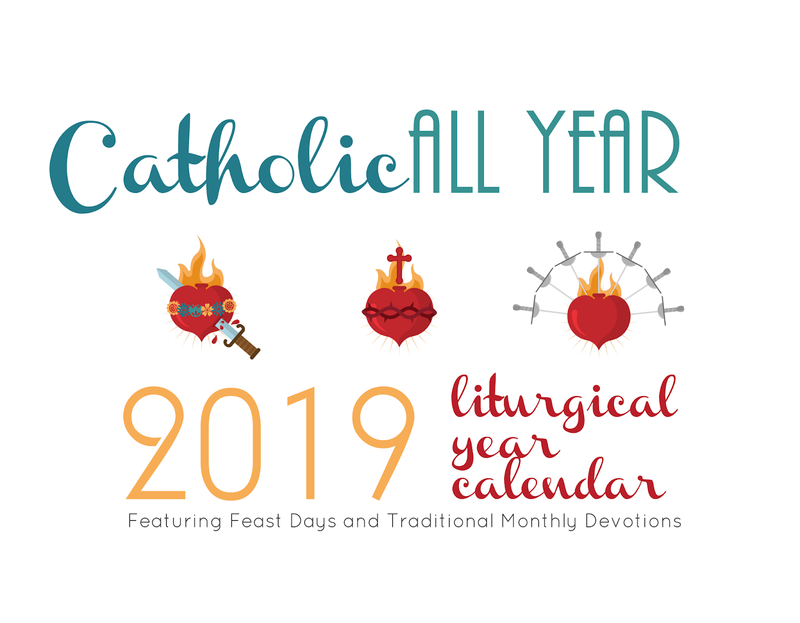 Participate in special celebrations for days universally designated for particular intentions (like Day of Prayer for Peace on January 1st, or Day of Prayer for Vocations on Good Shepherd Sunday, the 4th Sunday of Easter). Participate in the services of the Week of Prayer for Christian Unity: January 18-25. Recite the Look Down Upon Me, Good and Gentle Jesus before a crucifix, after communion, on a Friday during Lent. Recite the Tantum Ergo on Holy Thursday before the Altar of Repose. Adore the cross on Good Friday. Renew your baptismal promises at the Easter Vigil and/or on the anniversary of your baptism. Participate in a Eucharistic Procession on Corpus Christi. Recite the Act of Reparation to the Sacred Heart of Jesus on the Feast of the Sacred Heart in a church, religious community, or family. Use an article Blessed by the Holy Father or any bishop on the Feast of Sts. Peter and Paul. Visit a basilica or cathedral on the Feast of Sts. Peter and Paul. The Portiuncula Indulgence of St. Francis of Assisi: with a contrite heart, visit any church on August 2nd (or the first Sunday of August if the church isn’t open every day). Pray for the dead in a cemetery November 1-8 (applicable only to the souls in purgatory). Pray for the dead in a church on All Souls’ Day (applicable only to the souls in purgatory). Recite the Act of Dedication to Christ the King on the Feast of Christ the King in a church, religious community, or family. Free Printable! Click on the photo to open it in a new window, then right click to save it to your computer. 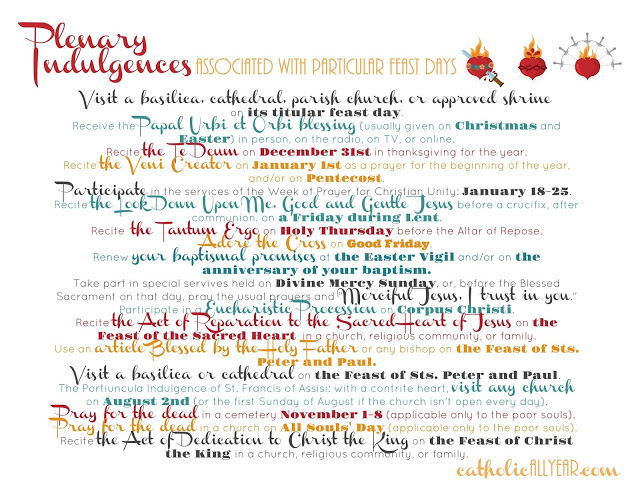 If you’ve got the Catholic All Year Liturgical Wall Calendar (or any other calendar, of course!) just print this out and tape it to the back cover, so you’ll know about upcoming indulgence opportunities. Use a properly blessed crucifix, cross, rosary, scapular, or medal. Pray to the merciful heart of Jesus. Perform charitable works or charitable giving. Make a voluntary Christian witness to others. Teach or study Christian doctrine. Visit the Blessed Sacrament for any amount of time. Recite a Rosary alone, or recite a partial Rosary. Make an Examination of Conscience. Spend time in mental prayer. Listen to preaching of the Word of God. Visit a cemetery and pray for the dead any time of year. Make the sign of the cross using the customary words. Renew your baptismal vows at any time. Click on the link for the text of the prayer. 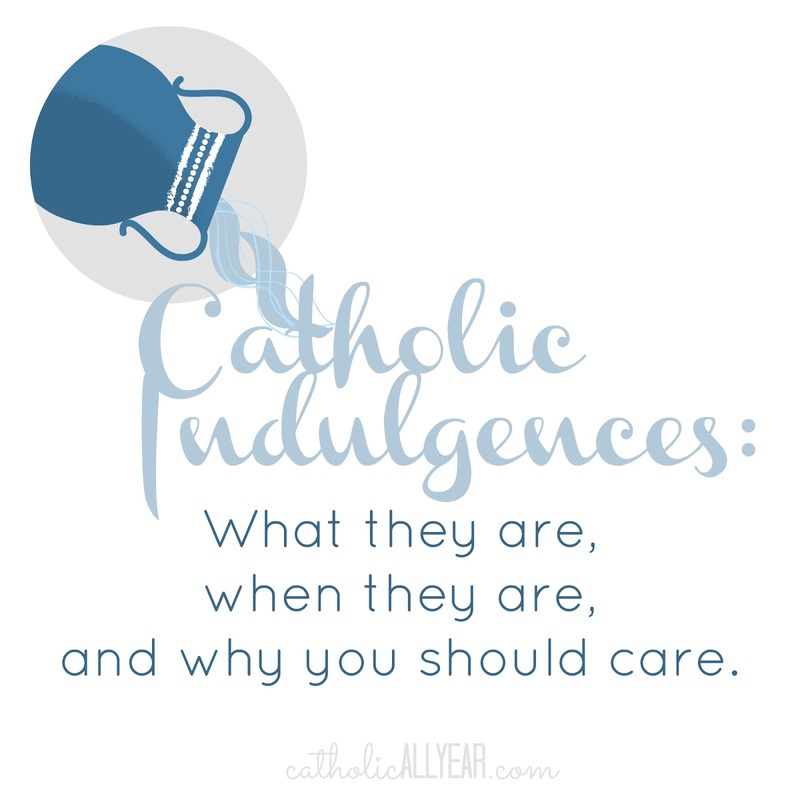 So, there you go: everything you never knew you wanted to know about indulgences. 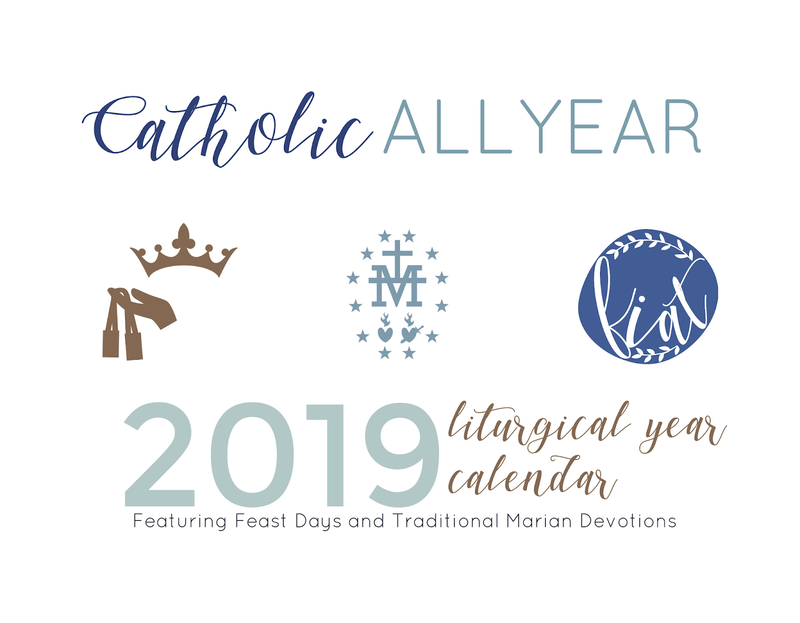 Over the past few years, we’ve been slowly incorporating them more and more into our family’s liturgical living traditions. My big takeaways in learning what I’ve learned so far about indulgences are . . . Attempting to obtain indulgences is like following a Vatican-approved training program for strengthening your faith, while at the same time getting the amazing free bonus of time out of purgatory. 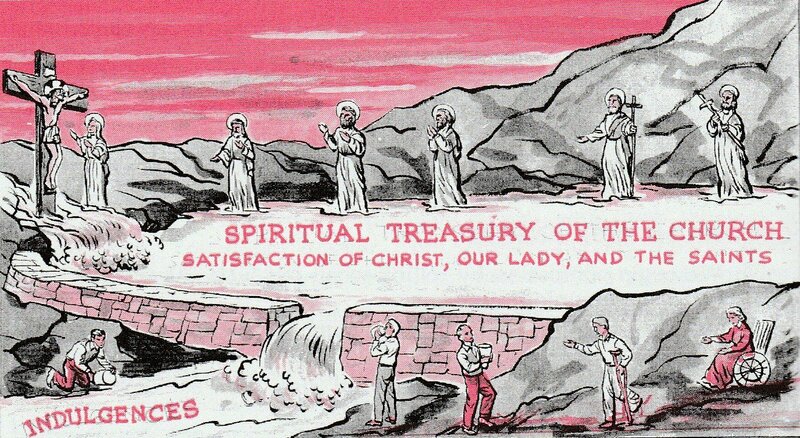 Obtaining indulgences for the poor souls in purgatory is probably the single most charitable thing you could possibly do in your lifetime. 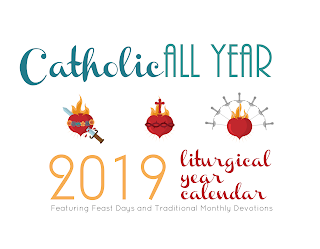 If your goal is quantity: daily Mass, monthly confession, and a daily family Rosary including prayers for the Holy Father will get you a plenary indulgence (or at least a partial one, depending on the attachment to sin angle) every day of the year, in about an hour a day. 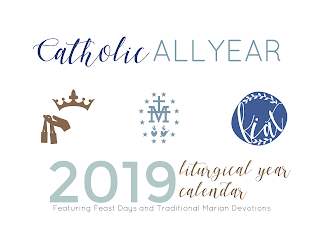 If you are looking for a Whole Catholic Living approach: incorporating any or many of the yearly indulgences into your family’s annual traditions is a beautiful way to share in the deep history and universality of our Catholic faith. Speaking of Whole Catholic Living . . .
As the Church year begins with December, so does this calendar. You get December 2018 through December 2019, thirteen months. Available for purchase here. Thanks! Coupon codes are available from the publisher here. Or it’s available as a pdf download here. I’ve also recently created monthly devotion images, formatted as high resolution 9:16 smart phone lock screen wallpapers, and paired with coordinating home screen images. 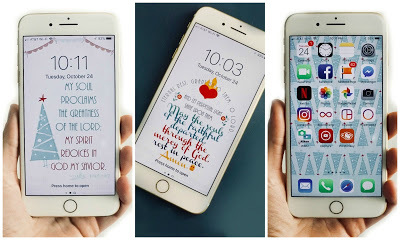 If my phone is going to be the first thing I look at when I wake up and the last thing I look at before I go to sleep, it might as well direct my thoughts to God and the monthly devotions recommended to us by the Catholic Church! The images are also high resolution enough to be cropped and printed as 5×7, 10×13, or 12×18 prints. This is so thorough! Thanks! Very interesting! But I think you mean "enchiridion," not "enchidrion." It probably comes from the same root as "chiropractor." Hmph for autocorrect if it doesn't catch common words like "enchiridion." 😉 Thanks for fixing it! I loved your broken vase example! Very helpful for my grew-up-Protestant mind to wrap around! Stupid question from a brand-new Catholic – do we "assign" who our indulgence is for? Is that part of having the intention of gaining the indulgence, that we mentally say, I'm doing this to earn an indulgence for ___? Excellent question! We definitely can ask that the indulgence be applied to a particular soul (but not someone who is living). If that soul doesn't need it on account of already being in heaven (yay!) or being, um, past help (boo) God will apply it to a different soul in need. Thanks for continuing to engage on this topic. There is so much mis-information. I grew up Protestant, and of course this was/is many of the mis-understandings and protests out there. I think it was Scott Hahn who described it as pulling a nail out of a piece of wood. God forgives us/removes the sin (pulls the nail out of the wood). The wood is still damaged from the nail there (temporal consequences due to sin). When I think of sin as wounding, reparation and indulgences make perfect sense. My priest describes purgatory as like detox from our sins, also makes perfect sense to me. This is so helpful and thorough, Kendra! Thank you so much! I also really appreciated your post on Ember Days. I had the blessing of meeting you and your beautiful family this past summer for just a moment in Yellowstone at Mammoth Springs. 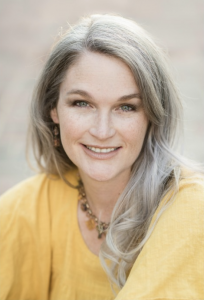 I have followed your blog for several years now, and it has helped me greatly in living out my Catholic faith in our home with enthusiasm. Thank you so much for your faith, and for sharing it with all of us! I love indulgences! It was always my favorite lesson when I taught Catechism. When my husband and I found out that you get a plenary indulgence for saying the Rosary with your family (under the usual conditions) we started adding a prayer to our family Rosary for "Detachment from all sin, mortal or venial." Because, really, what else can you do about that requirement, but ask for grace? My husband's goal is to make "365 new friends every year" (that is, souls in purgatory who benefitted from our plenary indulgences). Can you imagine all the intercession you would have going for you if a bunch of saints had you to thank for getting them out of purgatory? Well, Kendra, I've missed hearing from you for the last year, and now you're back with quite the bang! Where is this in scripture? Catholics believe that there are two sources of revelation that make up the entire deposit of faith: Sacred Scripture, and Sacred Tradition. We receive Tradition, handed down through the teaching authority of the magisterium. Indulgences are an example of the “binding and loosing” authority that Jesus handed down to his apostles, and they handed down to the next generation of priests and bishops. Which books would be included in the Bible and which wouldn’t is another example of Sacred Tradition. Kendra, this is the most concise explanation of this topic I have ever run across. Congratulations. I keep getting hung up on the phrase "free of all attachment to sin even Venial sin". I can say a prayer or affirmation to that affect because we all know we will sin in the future so we will never be free from all attachment to sin. I guess "Catch 22" circles my head on this one. Can you please comment. Yes! Absolutely. It’s rather a terrifying phrase isn’t it? We all sin, and more often than not, we have have habitual sins that we find ourselves committing and confessing over and over again. That’s not ideal, of course. When we make a good confession, we resolve to never commit those sins again. However, if we’re being honest, we know that we will likely fail in that resolution and we will commit those sins again. That’s okay, as long as we hate the sin and try to do better. My understanding is that attachment to sin means that you not only commit the sin again but you have a love for the sin. You don’t sin, and fail, and hate the sin, and try to do better but fail, rather you excuse it for yourself, or kind of like it, even though you know you shouldn’t. Even this kind of sin can be conquered though! A good spiritual director, receiving partial indulgences, many confessions, frequent reception of the Eucharist (if the sin is venial) or daily acts of spiritual communion (if the sin is mortal) can strengthen us to root out attachment to sin! A priest gave me a very similar answer as yours above. I guess if I had to put this into my own words it would translate to "Holy Perseverance" and/or always striving to improve on a daily basis. If you are sincere in this endeavor God will know it even though you might regress from time to time. And on that basis a plenary indulgence doesn't sound so distant and unreachable. Good Morning Again Kendra, on a related matter to indulgences, I have always interpreted "Good Works" as the fulfillment of my daily duties in life in a responsible way. I would like your take on this and if there is a deeper meaning to "Good Works" that my simplistic approach has overlooked. I would also like your take on what constitutes "Penances". I for one still do not eat meat on all Fridays which kind of dates me, so I consider that to be a "Penances that I can offer up to the Lord and Blessed Virgin for the souls in purgatory. Other things that come to mind are things like fasting, or forgoing other pleasurable events/things in my life. Am I interpreting this correctly? I have a similar approach to yours. I think "good works" is understood to include prayer, fasting, and almsgiving, in addition to the responsible fulfillment of one's daily duties. And "penances" for us includes Friday abstinence from meat, but also the seeking out of other small mortifications, like eating more of foods we don't prefer and less of those we do, choosing to do least favorite tasks first, etc., and joyful acceptance of the mortifications that find us, like traffic and frustrating people. This post has a good explanation, I think: WHAT IS MORTIFICATION? Hi Kendra again. It's been awhile but I have another question and you really seem to always make a lot of sense to me, something that is rare in this life. SO, I have carried a brown scapular that I actually received in Catholic grade school, a very long time ago, my entire life even through Vietnam. During the Fatima anniversary which I didn't even know was going on, I went to mass one Thursday morning which was normal and a group of nuns (?) were there handing out new scapulars so I took one and at the end of mass the priest blessed them and I went on my way. To fast forward do I actually have to wear this scapular or can I just carry it in my wallet? I can't believe the Virgin Mother would write me off on a "technicality" if I died and it was in my wallet rather than around my neck. PS. I was a "fallen away Catholic" for 30 years and have a lot of ground to make up. I also worked for a company/customers that required excruciating attention to detail and I tend to carry that over into my retirement, something that I think is counter productive from time to time…this being one of those times. Thanks for all you do for us. Hey Philip! I agree that the Virgin Mother would NOT write you off on a technicality! The brown scapular is not a magic talisman, it's a sacramental, which means that when we devoutly use it, it helps dispose us to better receive the graces of the sacraments. However, there are requirements for this particular sacramental, which include wearing it always except when bathing. It is meant to be a miniature version of the Carmelite habit, which is worn always by the Carmelites. But the brown scapular is just one pious devotion among many. If the requirements of the brown scapular don't work for your life, then you can always look for a different devotion. There's the Divine Mercy devotion, which usually involves saying the Divine Mercy chaplet at 3pm, there's a devotion to the Sacred Heart, which usually involves Mass on the first Friday of the month, or devotion to the Immaculate Heart of Mary on the first Saturday of the month. There's the Rosary, of course. My husband carries a 1 inch crucifix in his pocket as a sacramental. I think it's wonderful that you are in this time of searching! I'm sure Our Lady will help you find what is right for you, so she can lead you to her son. Hi Kendra…another question – I read the Catholic church teaches if you aren't a Catholic you will cannot go to heaven. If that is true I will accept it but I wonder about people like Billy Graham assuming he has lived the life portrayed. I guess I should really ask a priest but you are more convenient and quicker to access. Any thoughts on this question? Philip, I'm obviously not Kendra, but I thought I'd reply and then she can elaborate later. We do not know who gets to go to heaven. That's God's business. I would bet the rent that Billy Graham gets to go to heaven (and I am not a betting woman), but obviously I am not God, so I can't say with 100% certainty. It’s my understanding that the Catholic Church teaches that everyone gets to heaven *through* the Catholic Church, but that not everyone who gets to heaven was a practicing Catholic. As in, it’s through the sacraments and the graces of the Church established by Jesus on earth that any of us gets to heaven. But there are probably many people who live virtuous lives and get to heaven without being Catholic. I tell my kids it’s like climbing Mt. Everest. It’s hard. Many people try and fail to get there. If I’m going to try it I want a Sherpa and a gps and an oxygen tank, anything I can get to help me, but there are people who have summitted without any of those helps. It’s possible. But I’m grateful for the sacraments! Thanks Melissa, I am a Catholic trying to get back to God after many years absence. I am willing to accept that non Catholics don't go to heaven but if that is the "dogma", but I can't believe God would let this type of thing happen and I believe there are many other in the same boat. Will Kendra get this communication to weigh in on? Thanks for responding. PS. I Agree with you! Hi again Kendra, I hope I am not making a pest of myself but I have another question. I buy "things" from a company in Charlotte, NC called THE CATHOLIC COMPANY. One of their offerings is a series of educational instructions on the Catholic Faith once every quarter or so and covers roughly 20 to 30 readings/videos. It costs about $20 to $30 per series so it is not real expensive. Just curious if you have heard of it and if so what you thoughts are one it. I realize it will not get me to heaven but it is very informative and answers a lot of my questions. Not at all! I’m happy to help where I can. I’m not familiar with this particular series, but in general the Catholic Company has a good reputation, so I would guess that this is good content! You might also want to look for Bishop Barron’s series called Catholicism. It’s very well done. You might also ask if your parish has a subscription to formed.org. Many do, and it gets you as a parishioner access to tons of excellent Catholic digital content. What do you mean “if your indulgence requires…” how do you know what sin requires what indulgence? The indulgences themselves have conditions and requirements. They are things like having a particular disposition, going to a particular place, sometimes on a particular day, often there are particular prayers required, etc. In order to obtain the indulgence, one must meet the requirements of the indulgence. It doesn't have anything to do with a particular sin. You can't "apply" an indulgence to one particular sin. A plenary indulgence, gained completely, remits all the temporal punishment due to all of a person's sins. A partial indulgence remits some part of the temporal punishment due to all of a person's sins, but isn't applied to one particular sin.